If you have 13 World Series of Poker bracelets you apparently can get away with it. 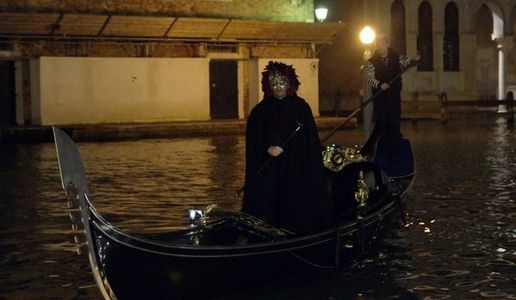 On Tuesday, Phil Hellmuth arrived at the World Poker Tour Venice on a boat known as a gondola, dressed in a black cape and a Venetian carnival mask. Despite his grand arrival, Hellmuth busted before the day was over. Poker pro Liv Boeree managed to get another photo of Hellmuth before he hit the rail. Hellmuth has done stunts like this multiple times before. He once showed up at the WSOP being carried in as a Roman emperor. i've always been of the opinioin that hellmuth is a weak pathetic excuse of what it means to be a man but now i am thorougly convinced the guy is mentally ill.......he clearly has issues. "What it means to be a man" can be judged by how he plays a game? The guy provides for his family and seems like a cool guy outside the game. I am not sure who you are that you can be so spiteful, but I think you put too much importance on his profession. In any case, thank goodness for Hellmuth; he brings some Vegas showmanship to these events and helps publicize them. 13 bracelets and he tries to bring some fun to these dreary events. so who said anything about judging him based on how he plays poker?....and i put zero importance on poker as a profession....i simply made a statement based on what he says, does, doesn't do and thinks.....the guy has no shame and has cast aside any dignity he may have once had. Phil can do what he wants. He isn't hurting anyone. He is trying to inject some fun and pageantry. No reason to just bash him. none of the forementioned is meant as a bash....just callin it like it is.....aside from his accomplishments his actions also speak volumes. ".just callin it like it is"
.. says the player that obviously confuses his opinion with fact. People have to understand that for Phil Hellmulth, Poker and his family is his life. Winning 13 WSOP bracelets put him at the top of the list for best poker players. He is an entertainer, he live in Las Vegas for heaven's sake. He can do want ever he wants. He is fun to watch and he make me laugh. He is one of the good guys. @x19 and how many bracelets have you won? Hell, how many tournaments have you won? Yep, that is what I thought. The man can do what he wants. He knows that making the final 6 is pretty far fetched, so he has guaranteed himself some TV time. Shrewd move. Phil Hellmuth might be the only big time poker celebrity that has always gotten it. He has not only cashed in on the poker boom of 2003 but he has continued to win and collect hardware! Actually, when you compare this with his frequent infamous ranting and bitching about why he's the best or why the person that just busted him is an absolute moron this is pretty tame and acceptable behavior for Phil. (btw, I've actually won a few online and real table poker tourneys - no WSOP ring though. Hope that qualifies me enough to give my personal opinion). If you take John McEnroe, Muhammad Ali, and Tiger Woods (with a tiny little smidge of Dennis Rodman), you've got Phil Hellmuth wrapped up in a nice neat little package. Ali always touted himself as the greatest--and backed that up on many many occasions. Rodman...there's where you get those Eyes Wide Shut costumes and Roman Emperor schticks. And, finally, Tiger Woods...who only a few days ago reminded us that "winning takes care of everything." Ya, Hellmuth is out there...but boy does he EVER back his s*** up! Phil has always been of the opinion that poker needs some showmanship and that he is in a position to provide it. I find people's opinions on this will usually (unfairly?) help build their opinion of Hellmuth as a man. Looks like Lady Gaga to me, And as soon as I beat him in a tourney I'll tell him that. But not until then.